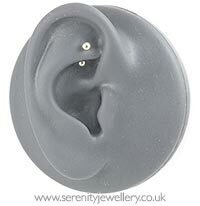 Hypoallergenic gold PVD titanium curved barbells secured by 3mm screw-on balls. Available in 6mm and 8mm bar lengths. Also known as bananabells. Love this item, the beauty of gold and the assurance of no allergic reaction. I look forward to wearing this on a special occasion. Once again, great customer service, fast delivery, what can I say but try this company.